Not to be confused with Opel Astra, Vauxhall Astra, Holden Astra, or GMC Astro. 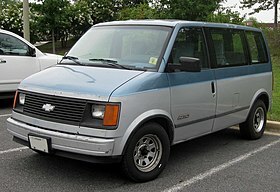 The Chevrolet Astro is a van that was manufactured and marketed by the Chevrolet division of American auto manufacturer General Motors from 1985 to 2005. Sold alongside the GMC Safari, the Astro was marketed in multiple configurations, including passenger minivan and cargo van. The Astro and Safari are GM M-body vehicles, using a rear-wheel drive chassis; all-wheel drive became an option in 1990. For its entire production, the Astro and Safari were produced by Baltimore Assembly in Baltimore, Maryland; the vans would be the final model line produced by the facility. In total, approximately 3.2 million Astros and Safaris were produced from 1985 to 2005. The Astro and Safari were introduced for 1985 as the first minivan from General Motors. While marketed as a response to the first-generation Chrysler minivans, GM adapted a rear-wheel drive layout, sizing the Astro and Safari closely to the short-wheelbase Chevrolet G10 van. Similar to the Ford Aerostar, to reduce production costs, GM adapted light-truck powertrain components; engines and transmissions were sourced from the Chevrolet S-10, allowing for a towing capacity of up to 5,500 lb (2,500 kg). Prior to its use on a minivan, the Astro nameplate was used twice by General Motors; in 1967 (for the Chevrolet Astro 1 concept car) and from 1969 to 1987 (on the GMC Astro COE semitractor). GMC sourced the Safari nameplate from Pontiac (used by the latter to denote woodgrained station wagons). As GMC was half of the Pontiac/GMC Division (later including Buick), from 1985 to 1989, both GMC and Pontiac Safaris were simultaneously offered through the same dealership network. Initial advertising boasted that it was a vehicle that will "make you realize that life is too big for a minivan", referring to the Chrysler minivans. The van can have a seating configuration between two and eight passengers. Engine choices ranged from a 98 hp (73 kW; 99 PS) 2.5 L four-cylinder to a 200 hp (149 kW; 203 PS) 4.3 L V6, depending on options and/or model year. Much like the second-generation GM F-body 1970-1981 and X-body vehicles, the GM M-van (Astro/Safari) had a bolt-on subframe. For the M-van, the front suspension shares most components with the GM B-body station wagon (Chevrolet Caprice, Oldsmobile Custom Cruiser and larger variants of the Pontiac Safari and Buick Estate Wagon) with a leaf-spring rear suspension. The lower ball joints were larger than their B-body counterparts (similar to 1977-96 Cadillac D platform vehicles, e.g., Fleetwood limousines). These ball joints were later used in the final Chevrolet Caprice 9C1 (police package) cars manufactured in 1995 and 1996. They also shared many mechanical similarities to the GMT 325/330 midsize S/T pickups and utility vehicles. 1989 was the final year that the Borg Warner T-5 manual transmission was made available. All subsequent models were equipped with 700r4/4l60e automatic transmissions. In 1990 a new all-wheel drive (AWD) system (the first U.S.-built minivan to do so), designed and developed by FF Developments (FFD), was made optional. The AWD models had a lower fuel economy: 17 miles per gallon highway versus 20 to 21 miles per gallon for rear-wheel drive vans. AWD Astros used a Borg Warner 4472 transfer case. Also in 1990, a new dashboard was introduced along with the availability of an extended body option, sharing its wheelbase with the shorter version. The 1990 model year also introduced the hydroboost braking system, a system using the same accessory belt driven pump to supply the power steering and brakes. In 1992, a new optional door form was introduced, colloquially known as Dutch doors. This form was two bi-parting doors with a flip-up window above. Previously, Astro and Safari vans were equipped only with bi-parting doors. An optional 4.3 L (RPO L35) engine with central port injection and a balance shaft was phased in. In 1993, an electronically controlled 4-speed automatic transmission with overdrive became standard as the sole transmission offering. As with many other 1993 model year GM vehicles, Scotchgard fabric protection also became a standard feature on Astro vans equipped with cloth seats. 1994 also saw the addition of three new exterior paint colors. These colors were Indigo Blue Metallic (#39), Light Quasar Blue Metallic (#20), and Medium Quasar Blue Metallic (#80). For the 1994 model year, GM started manufacturing most of their vehicles, including the Astro and Safari, with CFC-free air-conditioning systems, which used R134a refrigerant instead of R-12 refrigerant. In 1995, the model was facelifted with an extended nose that resembled the then-new full-size Express vans; while the original square headlights were retained for use on the cargo vans, the passenger-carrying variants now used horizontally-mounted rectangular headlights that had debuted on the full-size trucks in 1992, and would eventually appear on the smaller trucks in 1998. Also for 1995, the shorter length body was dropped. In 1996, a redesigned dash received a passenger side air-bag. The vans remained mostly unchanged until the end of production in 2005. In 2003, GM upgraded the chassis of both the Astro and Safari with certain suspension components, larger brakes, and six-lug, 16 inch wheels from the full-size Chevrolet and GMC half-ton pickup trucks. The last Astro and Safari rolled off the assembly line on May 13, 2005. The Insurance Institute for Highway Safety (IIHS), gave the Astro a "Poor" rating in 1996 because of a display of structural failure in the Institute's 40 mph (64 km/h) crash test into a fixed, offset barrier. The underbody of the test van buckled, pitching both front seats forward and shoving the crash dummy into the dashboard and steering wheel, and resulting in a broken left leg, leading the Institute to comment that "[t]he collapse of the occupant compartment left little survival space for the driver." In testing performed by the National Highway Traffic Safety Administration (NHTSA), however, the Astro and Safari fared better, improving from a single-star rating in 1991 to a three-star (driver) and four-star (passenger) rating by 2000. In side impacts, the Astro and Safari both received the highest, five-star rating in every year that the test was administered. In 2007, the IIHS reported that the 2001–2004 model year Chevrolet Astro recorded during calendar years 2002–2005 the least number of killed drivers of all passenger vehicles in the United States, as calculated per every million units on the road. Driver's habits and vehicle usage might have influenced this result. ^ "Chevrolet Astro I Concept car". ultimatecarpage.com. Archived from the original on March 3, 2016. Retrieved February 28, 2016. ^ Keefe, Don (December 2005). "1967 Chevy Astro I". Hemmings. Archived from the original on January 5, 2017. Retrieved February 28, 2016. ^ Gunnell, John (1993). Standard Catalog of 4x4's 1945-1993. Krause Publications. ^ "Vehicle ratings - Chevrolet Astro 1996-2005 models". Insurance Institute for Highway Safety, Highway Loss Data Institute. Archived from the original on June 2, 2006. Retrieved February 28, 2016. ^ "Drivers deaths by make and model: fatality risk in one vehicle versus another" (PDF). Status Report. Insurance Institute for Highway Safety. 42 (4). April 19, 2007. Archived from the original (PDF) on January 17, 2014. Retrieved February 28, 2016.